THE MYSTERY LIGHTS — WHAT HAPPENS WHEN YOU TURN THE DEVIL DOWN – IS YOUR CLAM IN A JAM? The Mystery Lights are originally from Salinas, California, but have moved to NYC to pursue their musical career – this could sound like a strange move since their bluesy, reverberated garage surf punk fits in perfectly with the scene out West, where labels such as Burger Records and LOLiPOP would probably have been on them within the second rehearsal, but at the same time this allows them to not get lost in the myriads of Cali psych bands. 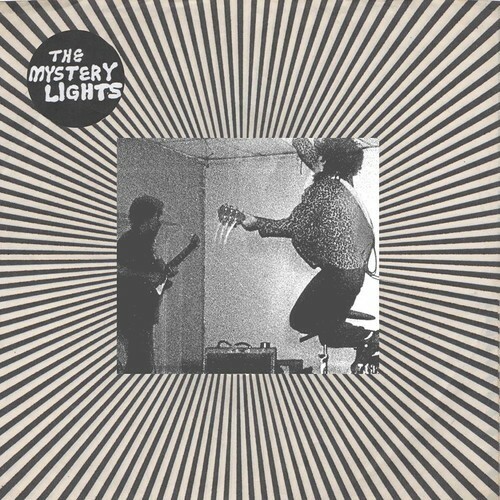 Their first, self titled EP came out in March, while their second, At Home W/ The Mystery Lights came out at the beginning of the month and are both jam packed with reverberated frenzy a-la-Night Beats. What Happens When You Turn The Devil Down is like stumbling down a dark hallway, at the end a red light signals the frame of a door, and next to it a figure stands leaning on the wall, one leg bent behind him and his foot loudly tapping on the wall. As you get closer, the smell of his cigarette smoke gets thicker, and as you walk next to him, he smiles and offers to buy you a drink at the bar behind the door. You walk into the room where red velvet walls and candlelight adorn the interiors, a bartender with a pencil moustache in a white shirt and red bow-tie grins at you from behind the large wooden bar. The stranger nods at the moustached man who pours you both two fuming, frozen, tumblers filled with a strange green liquid. The man raises his glass to you and cheers for your good soul, but as your lips brush against the rim of the glass, a strange feeling deep down in your chest tells you that there’s something wrong with where this is heading. You put the glass back down on the bar and the stranger’s smile starts to fade and his face starts to get tense. Your feet start to move towards the hallway, where a set of wooden stairs leads to the street outside. As you walk up the first steps the wood under your feet starts to crack and break away, you can see the light from above and a red mist coming from below, as the stairs around you start to disappear, you slip but a strange homeless man with a white beard and long white hair pulls you up into the street. Check out What Happens When You Turn The Devil Down below and go get their EPs HERE.